World-renowned DJ and producer Paul van Dyk is to participate in the 'Our Table Is Yours', Thanksgiving dinner benefit event tonight. The event is hosted by the Food Network, Cooking Channel and Southern Wine & Spirits of America for invited guests affected by Hurricane Sandy, and takes place at Cipriani Wall Street, New York City. More than 1,000 New York City seniors, singles and families who were impacted by Hurricane Sandy will get a brief reprieve from the effects of the storm at "Our Table is Yours," a special Thanksgiving Dinner hosted by Food Network, Cooking Channel and Southern Wine & Spirits of America. Cipriani Wall Street® will open their doors on Wednesday, November 21, 2012 to 1,000 invited guests who will be served Thanksgiving Day style meals throughout the day. Paul van Dyk will join celebrity chefs and other special guests, to be announced, to lend his support to those affected by Hurricane Sandy in New York City. His serving time will be from 4:00 pm – 7:00 pm. Paul, participation in “Our Table Is Yours” leads up to his headlining Thanksgiving show at Pacha the following night (Thursday, November 22). He will also be donating a portion of his fee to the Food Bank For New York. The daylong event will support Food Bank For New York City’s ongoing efforts to deliver critical food and water to those affected by Hurricane Sandy in the wake of its destruction. 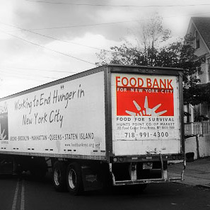 Since the hurricane hit, the Food Bank has continued to serve hungry families directly, as well as through its city-wide network of soup kitchens, food pantries, and other hunger relief programs. Emergency food supplies were distributed to emergency feeding programs, operational soup kitchens, food pantries, senior centers, and agencies across the five boroughs including the hardest hit areas in Far Rockaway, Coney Island, Redhook, Staten Island and Lower Manhattan. Each invited guest will also receive a prepared meal to take home, information on vital benefits and gift cards from various retailers to purchase essential items. Valuable information on how to apply for food stamp benefits (SNAP) and replace benefits that were lost in the aftermath of Hurricane Sandy will be available. Donations to support “Our Table Is Yours, Thanksgiving Dinner” and Food Bank For New York City’s ongoing relief efforts can be made at http://tinyurl.com/ourtableisyoursdonations.